commonly used for plaster machine application. Easier to install and a lighter alternative to self-furred metal lath. 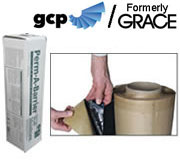 The unique patented design replaces old metal lath in a variety of wall applications. 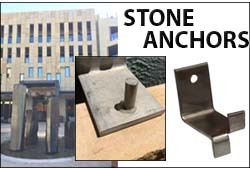 Designed for use with Stone and Stone Veneers. Weep Screed should be installed at the plate line or stem wall. 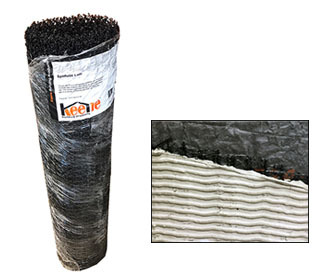 Allows moisture to migrate down and shed away from the wall. 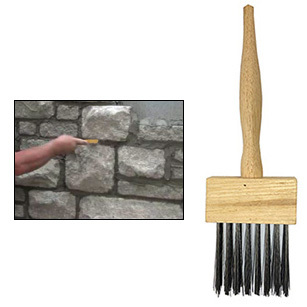 Great for raking cultured stone mortar joints. 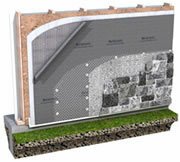 Creates a drainage/ventilation cavity environment behind natural and manufactured stone veneer walls. 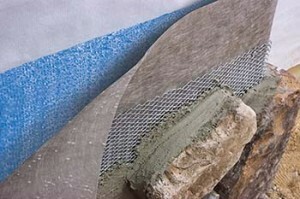 The polymer core mesh creates the airspace, while the lighter fabric prevents mortar from seeping into the newly formed cavity.